Last sunday I had the pleasure of providing Swing Patrol London with a bit of pre-dance hula hooping! Of course they threw themselves into it with the same enthusiasm that they fling their partners around the dance floor. After the hula hooping I found myself hovering at the edge of the dance floor watching in amazement as they twirled around the room... I started edging away slowly as I realised I was in danger of being asked to join in. Post by Happy Healthy Hoops. Just when I thought I was safe, a very dapper gentleman asked me to dance. I of course refused, explaining that I had only ever done one swing dance lesson and I was quite simply awful. But of course no wasn't a good enough answer and I found myself on the dance floor feeling as glamorous as some 1940's film star. That bubble was promptly burst as I stumbled and bumped into other couples. I was so embarrassed by my own awkwardness. But my partner chatted to me politely, asking about hula hooping, asking where I had done my first swing dance class (it was swing patrol by the way) and before I had even notice this handsome man said to me 'You realise when you're talking you don't stumble at all'. I was dancing and I wasn't awful at all, I wasn't amazing but I was definitely not awful and it was bloody fun thats for sure! It reminded me that distraction can be a really useful tool when you are learning new hoop tricks too. I know....Where are you going to find some hottie with enough patience to to chat to you while you work on the weave or the vortex?? Probably not going to happen right?! But try sticking on the TV on, some music or even read a book!!! Get smart about your hoop practice and stop over thinking things. Give your brain something else to think about for a or give your self a complete break and try a Swing Dance Class who knows you might even find prince charming. You are only limited by your own imagination! P.S. This event was so much fun I just can't fit it into one blog post but Antidote London I can't thank you enough for all the games. I have been writing this post in my head for months because I feel like people have got me all wrong. My job means that I meet a lot of fitness fanatics… they think I am one of them but I am not. Maybe I should keep this a secret but honestly if exercise isn't fun and interesting I am NOT doing it. Before I discovered hooping I’d water skied, tried pole dancing, power plates and the odd dance class here and there. I generally exercised for three months of the year and did nothing for the other nine months. I do not run and I do not do sit ups. I remember going for induction sessions at gyms and telling them my aim was to ‘feel good’ which fell on deaf ears every time. Some how it always translated in their minds to ‘loose weight’ or ‘tone up’ but I really just wanted to feel good and have fun. And this to me is one of the major problems with the fitness industry, most people just want to feel amazing and fell alive! I know, so shedding a few kilos is great too but when did we decide that it had to be all work and no play. What do kids do to keep fit? They play right? We don't stick them on a tread mill or make them lift weights. Please stop making exercise so awful, lets just go outside and play… please. That is what I love about hula hooping. Whether you're working on keeping the hoop spinning for more than a minute at a time or splitting hoops you are always learning and playing. I’m not a fitness junkie, I am a fun junkie! 1. For a good work out you’ll need an adult hoop (normally 39-41inches) which are much easier to use than a child hoop. Don’t worry, these are provided at classes and you will soon be able to purchase them online! 2. Stand with your feet hip width apart and stabilise your torso and legs. Every time the hoop comes across your tummy push forwards and pull back when it touches your back. This will also help you isolate your abs and get the maximum benefits from hooping. 3. Spin the hoop both directions. It might feel strange at first but it’s important to work out both sides of your body evenly. 4. Turn Turn Turn! If you walk in a circle the same direction the hoop is spinning it will make everything seem a little bit slower and easier. 5. Be patient! 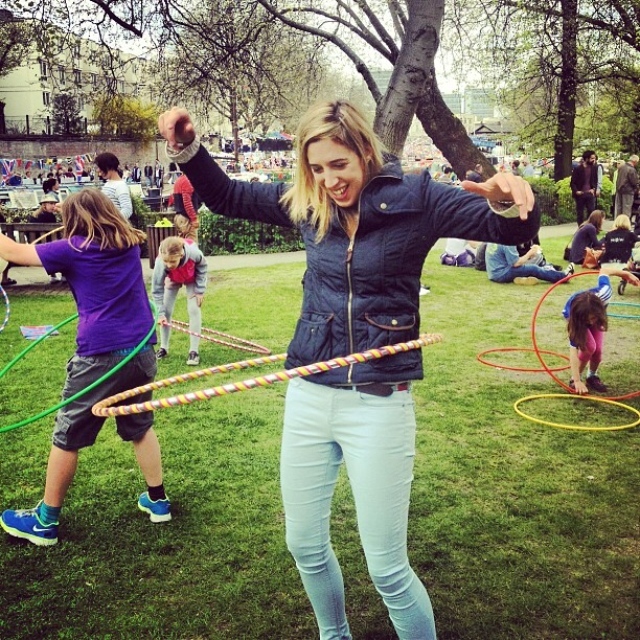 Hula hooping will do wonders for your coordination but it can time to get the knack of it. Happy Healthy Hoops have never had a student they couldn’t teach so come along to a class and you'll be hooping before you know it!